Hardcover, 10 x 12 in. / 320 pgs / 350 color. Broodthaer’s varied artistic practice is characterized by a deep concern with language and linguistic conventions, playing with ideas of authorship and uniqueness while revealing the cultural stereotypes and symbols of national identity embedded in everyday forms of communication. 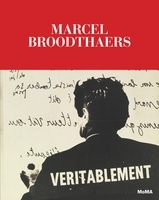 Illustrated with 350 superb color reproductions and produced under the editorial direction of the artist's daughter, Marcel Broodthaers is the definitive monograph on the Belgian artist who surmounted the Surrealism of Magritte with pioneering works of Conceptual art. Marcel Broodthaers filled his brief, 12-year artistic career with more ideas and works than most artists manage in a lifetime. This career began in 1964, following a period of more than two decades laboring in some obscurity as a poet in the Belgian Surrealist circle of René Magritte (a crucial mentor for Broodthaers) and Paul Nougé. He also wrote articles on art during these years, including early critiques of Pop art. Broodthaers' first exhibition, held that year in Brussels, was accompanied by a now-famous announcement: "I, too, asked myself if I could not sell something and succeed in life. I had for quite a while been good for nothing … Finally the idea of inventing something insincere came to me and I got to work immediately." 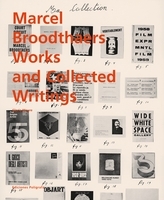 Traversing media freely-from installation and sculpture to artist's books, prints, film and writings-Broodthaers embodied the 'post-media artist' for whom any form could be recruited in the service of a larger conception. Those conceptions included institutional critique (of which he is a pioneer), art-historical critique, pastiche and philosophical-linguistic puzzles. 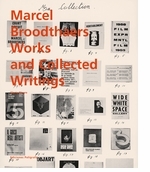 Edited by Broodthaers' daughter Marie-Puck, featuring new scholarship by Wilfried Dickhoff and Bernard Marcadé, and with a range of both classic and never-before-seen works, this handsome book is the largest and most authoritative Broodthaers monograph ever published. As such, it is the first substantial overview in nearly 25 years. It includes a biography, exhibition chronology and a selected bibliography of publications. Marcel Broodthaers was born in Belgium in 1924. From the late 1940s to the early 1960s he worked primarily as a poet, and was a member of the Belgian Groupe Surréaliste-revolutionnaire. After almost two decades of poverty, Broodthaers performed a symbolic burial of his career as a poet by embedding 50 copies of his poetry collection Pense-Bête in plaster. Broodthaers died in 1976, on his fifty-second birthday, and is buried in Brussels beneath a tomb of his own design that features images from his allegorical repertoire, including a pipe, a wine bottle and a parrot. An important collection of his work can be seen at The Museum of Modern Art, New York. 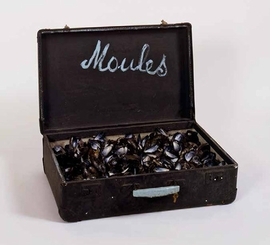 Featured image, Valise "Moules" (1965), is reproduced from Marcel Broodthaers. MARCEL BROODTHAERS, assembled by the artist-provacateur's daughter, Marie-Puck Broodthaers, would have impressed that connoisseur of cultural containers, whose parallel world of mislabeled objects, faux exhibitions, and even an imagined museum revealed the art world's flimsy foundations. "In this incredibly authoritative volume, Marie-Puck brings back to life her father’s working photographs and exhibition chronology"
Imagine being a Belgian artist who has the bad luck of coming after René Magritte, the genius whose "The Treachery of Images" ("Ceci n'est pas un pipe") upended representational art and inaugurated language-based conceptual art in one fell swoop. 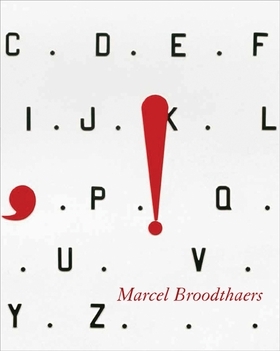 What do you, Marcel Broodthaers do as Belgian art's "second act"? In one of the first acts of artistic appropriation, Broodthaers steals Magritte's pipe, painting his own "Model: La Pipe" in 1969. In another effort to deal with Magritte's having been there and done that, Broodthaers created a fake stenciled street sign with the words "rue Rene Magritte straat" (note the text in both French and Dutch). Broodthaers' text accompanying the work read, "It is not sufficient to enter the street Magritte, but it is also necessary to go out of it!" In one of the first acts of "institutional critique," Broodthaers created a conceptual museum, the "Museum of Modern Art." In one of the first acts of "institutional critique," he decided that this "Museum of Modern Art" with its various "departments" would primarily exist in its own advertising announcements and ephemera. In one of the finest sound performances ever made, "Interview with a Cat," he records himself asking theoretical art criticism questions to a cat that meows back: The piece ends with him asking the cat alternatively whether "this is a pipe?" or "this is not a pipe." So Broodthaers ends up being the latecomer who succeeds at 'firsts' after all, influencing at least three generations of artists. FORMAT: Hbk, 10 x 12 in. / 320 pgs / 350 color.